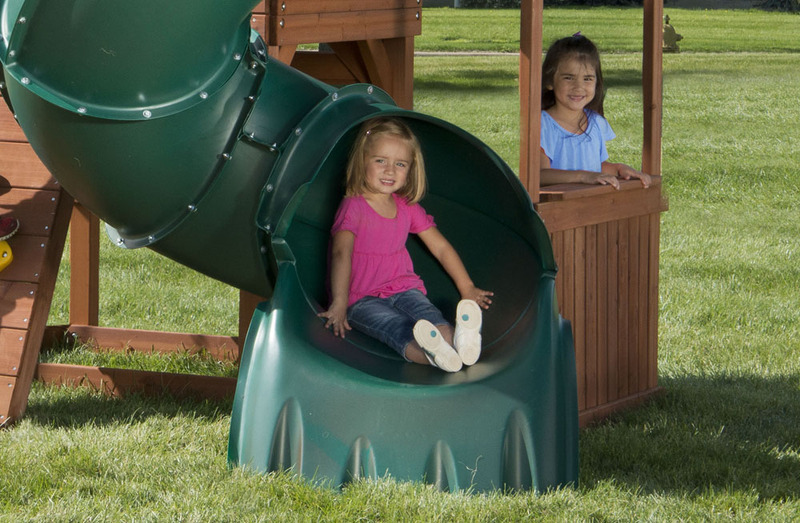 The included spiral tube slide is a favorite backyard playground activity as it provides an electrifying sliding experience that is full of gentle twists and turns. The adventurous rock climbing wall will encourage children to imagine themselves as their favorite action hero reaching the top of a mountain. In addition, the scaling rope will provide extra grip during their journey to the top. 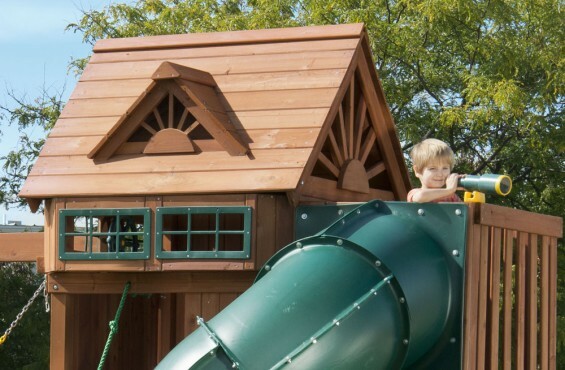 Once inside the two-tier play deck, children can play peek-a-boo with their friends via the look-out window and exercise their imaginative minds with the telescope and steering wheel. 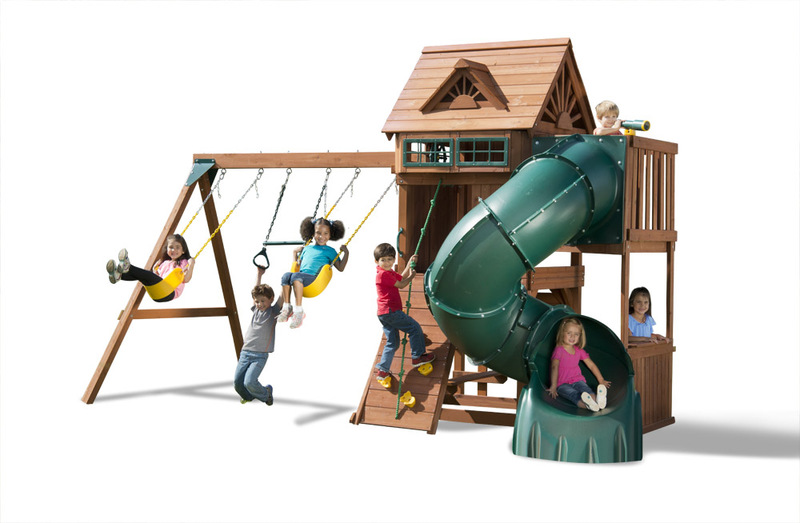 The Sky Loft backyard playground set also includes a 3-position swing beam outfitted with two premium belt swings and a trapeze bar with rings so children can swing next to their closest friends from sunrise to sunset. We design our playground sets to bring the excitement of the common playground to backyards across America. However, we have become the most respected playground set manufacturer in the U.S. by putting safety first, always. As an active ASTM safety committee member, we have gone beyond the normal safety guidelines to ensure your children are always safe. Here are the safety features included on our playground sets. ASTM guidelines recommended a 6’ safety perimeter around your backyard playground set as well as overhead. Add a fall surface (ground cover) under your playground set. 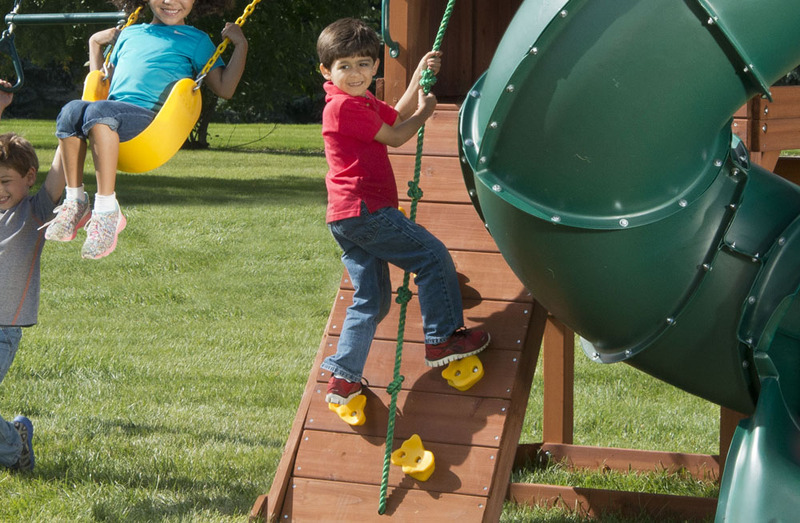 While our cedar backyard playground sets are hand-crafted to eliminate unnecessary cuts and scrapes, we suggest adding a fall surface under your play structure to add another layer of protection for your children – just in case they lose their balance and fall. We recommend to add rubber mats, rubber mulch, wood chips sand or pea gravel under your playground set. To see a pros and cons list of the best materials for under a playground set, check out the resources tab on this page. For a detailed guide on playground set fall surfaces, be sure to check out our resources tab on this page. This playground set is intended for residential backyard use only and is not warrantied for public or commercial use. 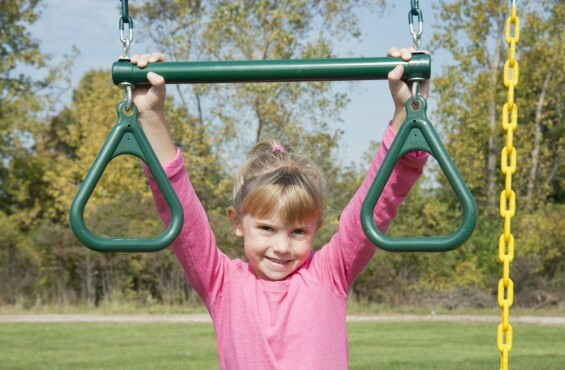 What to consider when buying a playground set? Before buying a playground set, always check with your homeowner’s association before assembly. Some HOA’s have height restrictions on building and play structures. Also, determine how much space you have in your yard. Will there be enough space for your children to run around with their friends safely? How many kids can fit comfortably on the playground set? This playground set has been designed for use by a maximum of eight children at one time, having a combined weight of 1,200 pounds. The Sky Loft Turbo is recommended for children 3 years through 11 years of age. How is the playground set delivered? 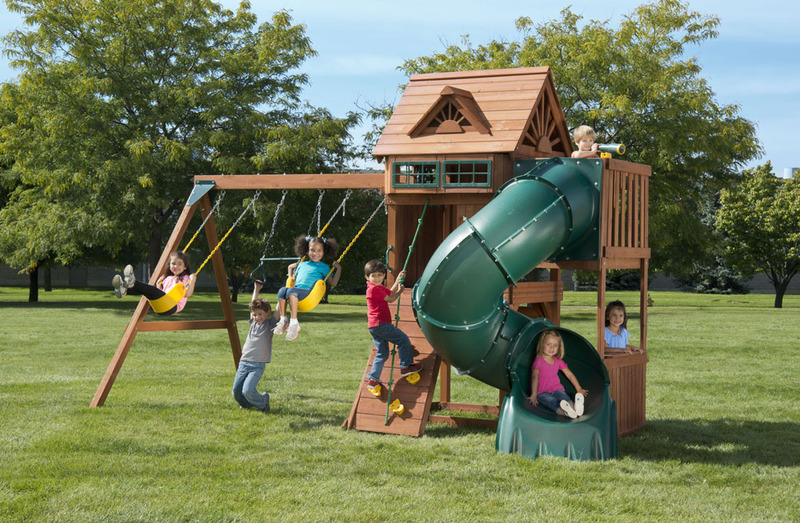 Once your playground set is ready to ship from our shop in Monroe, MI, the delivery company will contact you to schedule a delivery date and time. The typical playground set will be delivered curbside and comes in multiple bundles/boxes. Some larger packages may need to be opened and hand offloaded to the ground. It might be helpful to have another person help you bring the components into your backyard, but it not a necessity. 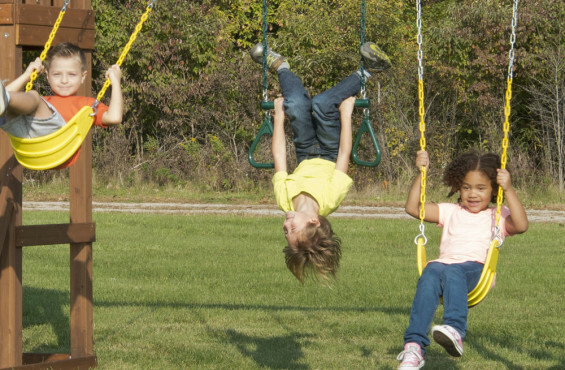 Can I swing on the playground set with my children? What kind of construction knowledge do I need to have to assemble your playground sets? We welcome anyone to build our playground sets, even those with little do-it-yourself experience. Each swing set kit is pre-cut, ready for assembly and can be built with basic tools, so you don’t have to be Bob Vila to install our swing sets. Actually, parents often comment on how much pride they have building their swing set on their own. Don’t worry, if you have questions during assembly, our dedicated customer service team can answer your questions via phone or online chat. Let us install it for you! We also offer professional installation on all of our playground sets for as little as $199. Checking, splitting and surfacing cracking are characteristics of all backyard playground sets. This is caused by varying seasonal temperatures and moisture conditions. To minimize this checking and/or cracking, you may coat your play set with a water repellent. The Sky Loft playground set is factory stained to provide a beautiful finish and long lasting protection. We recommend staining wooden swing sets once a year to maintain its rich color and naturally resilient qualities. Prior to staining, clean all wooden components. Use a high quality water based stain or sealant such as Thompson’s Water Seal® . After staining or sealing, please allow 24 hours to dry before allowing children to start their adventure. Overall the swing set is pretty nice but I was disappointed in the quality of some of the products. The telescope has broken already and I had to reinforce the tube slide after a couple of uses which could have been from the installer which I was also very unimpressed with. I am not sure if it was him but he just drilled some make swift hole for the rope over the rock wall. I would think the product would come already with a predrilled hole or better instructions. Again overall my son loves it so that is the main thing, I was just disappointed in the quality of some of the items and the installer.